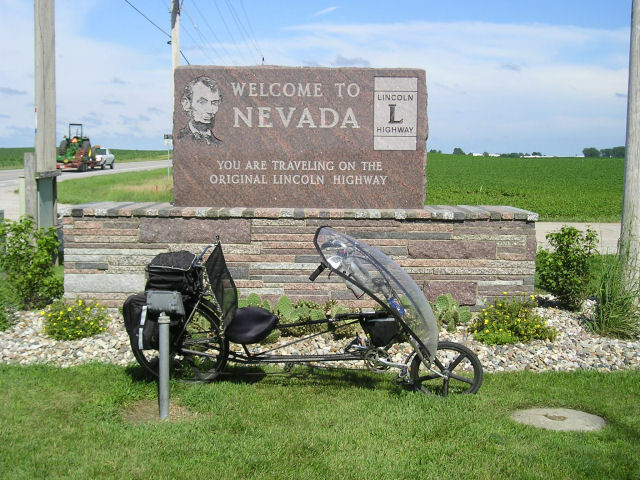 Goal for the week is to ride a lawn chair down the Lincoln Highway. In 1903 the first automobile crossed the USA and a decade later the Lincoln Highway was designated as the first cross country road, going from Times Square in New York City to downtown San Francisco. Now I'm not planning on riding all that distance... instead plan is to follow the route through Nebraska and parts of Iowa and see how many indicators I might see. My lawn chair is my long wheelbase recumbent bicycle. Both it and I are well suited for some long flat cycling. 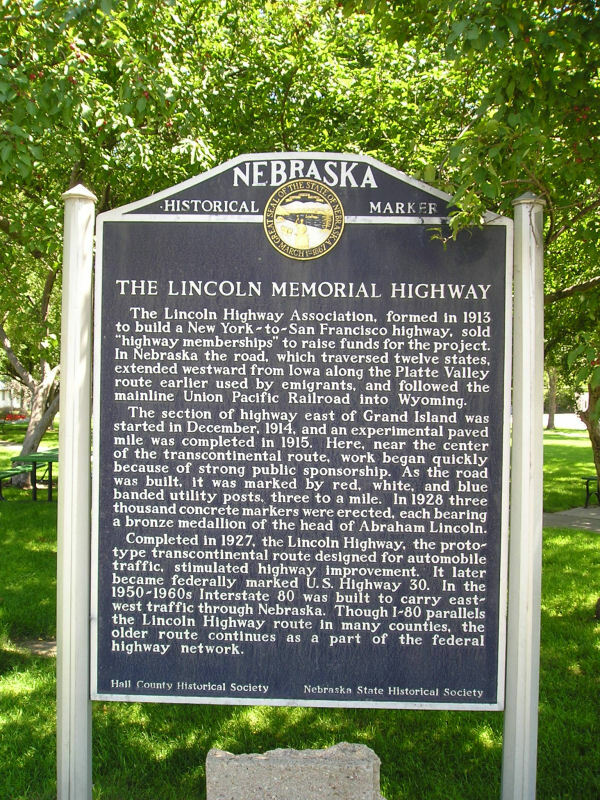 The first Lincoln Highway was mostly a rutted dirt path that follows the Platte River valley. 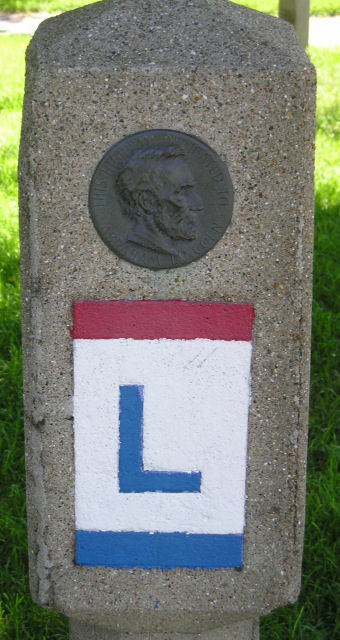 In this part of the country, US 30 follows most of the Lincoln Highway route. Today I left work mid-afternoon and got an early start. 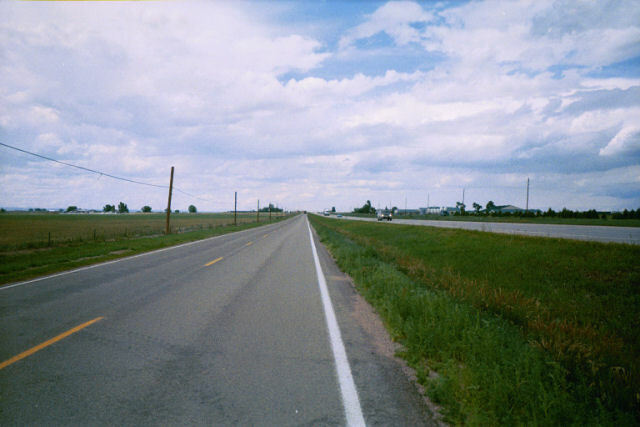 This was all familiar ground and went quickly as I cycled up from Fort Collins, followed the frontage roads for I-25 through Wellington and then the last 11 miles of Colorado on shoulder of the Interstate itself. The Cheyenne Ridge can be a windy place, but mostly calm and only a few drops of rain. My total elevation gain of 1000 feet slowed things slightly but not enough to keep me from entering Cheyenne well before dark. I crossed the US30 also known as "Lincolnway" and stopped at local motel with 52 miles total for the day. My GPS said 702 miles at home and now says 683 miles to go to my destination. Some long miles but hopefully long flat miles. Early promoters of the Lincoln Highway made an auto trip across the USA. 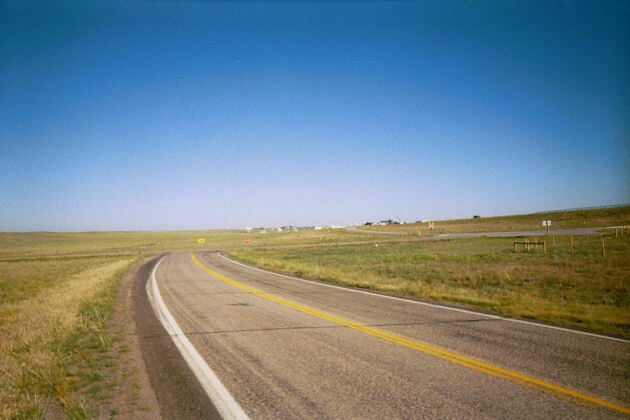 They recieved enthusiastic support from people in Colorado who assumed the route of the Lincoln Highway would be same as the promotion tour and hence go through their towns. 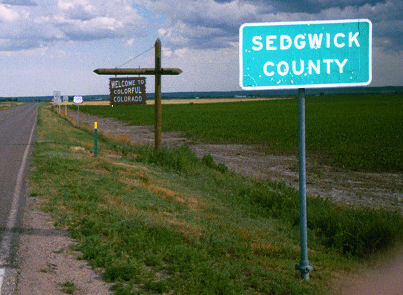 Once the route was announced, it bypassed both Colorado and Kansas. Governors of both states were not happy and for a while there was even a designated "spur" that followed the South Platte down into Denver. However that was later dropped and Lincoln Highway stayed north of Colorado. It is thus unplanned that my ride would bring me back through Colorado. However, I'm getting ahead of myself and will describe later.. This morning dawned nice and clear. Stop lights were blinking yellow as I followed Lincolnway through downtown and east out of town, stopping briefly for breakfast. After ten miles including one hill, US30 merged into I-80 and I followed frontage roads. My ride was smooth and quick, likely helped by very slight descent from Cheyenne to the east. Winds were very light for Wyoming. This was mostly ranching area with some irrigated crop lands. Without too much trouble I was already at Pine Bluffs and mile 43. At mile 44 was the Nebraska, birthplace of Arbor Day. 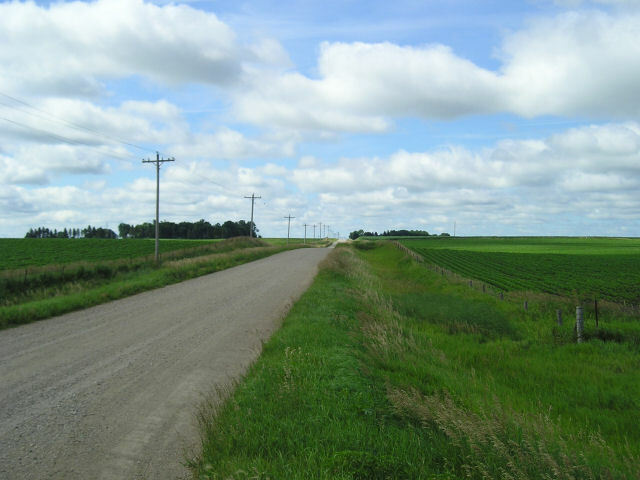 Unlike the early Lincoln Highway, my route was paved and smooth. Traffic was light. I went along the Union Pacific rail lines and at least once an hour a train would pass. I briefly even passed one as he slowed for yellow caution signals. A brief stop at mile 66 in Kimball and then on to Potter at mile 84 and lunch. Potter Sundries seemed to be the place to east. Folks at one neighboring table talked of the weather (hailstorms flattening crops) and at another two workers from the grain bins read novels. After Potter, another 20 miles brought me to Sidney and the regional center. Several Lincoln Highway signs were found here. Also Oregon Trail markers just outside town. I had traveled 104 miles but it wasn't too late so decided to get a few more miles. The road to Lodgepole was under construction. Parts of it were new asphalt that still seemed slightly soft and slowed my speed. Another part they alternated traffic from each direction to go past paving in progress. Finally at mile 121 paving was over and I was in town of Lodgepole. I asked about the motel in the next town. The woman wasn't very favorable. I said, "as long as it has bed and shower I'll be fine..." and set off for Chappell ten miles down the road. The Empire Motel was almost all the way through town. The office had a sign on the door "we're open, come in". However, nobody was in. I heard a TV in background, made some noise but still nobody. I looked up their number and called, still nobody. So decided to wait a bit. Tried again, but still nobody. Well, not sure how much to wait, but finally got out the maps and looked for alternatives. Next motel on my route would be Ogallala...slightly far. So decided to follow 385 and head towards Julesburg. This route followed the railroad. Just as I was coming to town, a storm started with wind and sprinkles. 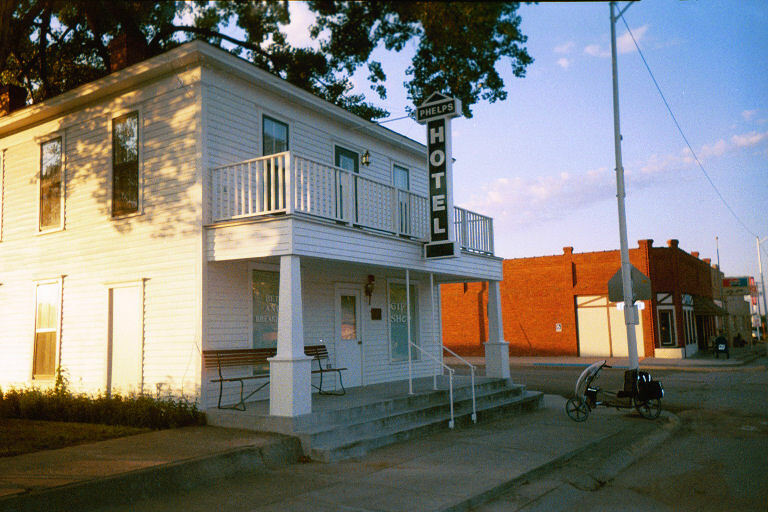 I was happy to find a motel in town. The first one was full but the only other motel in town had room. So, back across the Colorado border at end of a long 148 mile ride today. Tomorrow time to get back on route of the Lincoln Highway. My question for the day was to find out what was in these large grain elevators that form a centerpiece of small Nebraska towns. Concensus seems to be that they are mostly empty, but they mostly hold corn after the harvest. Wheat is found a bit further south (including all over Kansas). My route seems to include mostly irrigated land with corn and some other crops such as soybeans. Today I passed through a "narrow" part of the transportation corridor. By narrow I mean that multiple paths all choose the same route: Oregon Trail, Pony Express, Mormon Pioneers, Lincoln Highway, Union Pacific Railway, etc. There is supposed to be a museum near Cozad that explains it all, but I'll likely be by too early in the morning. I started the day in Colorado, but after two miles cycling crossed over to Nebraska, Home of Arbor Day, again. Another few miles to cross under I-80 and mile 12 to reach Big Springs. The road climbed a hill out of Big Springs and I was surprised to see Lincoln Highway signs on one of the gravel roads. I climbed up over the hill and then early morning cool riding to reach Ogallala at mile 33 for breakfast. 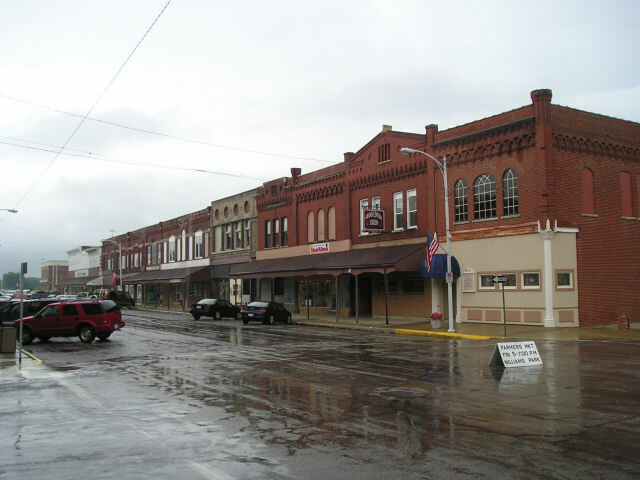 Ogallala has a similar layout to other small towns. US30 goes along the north and I-80 at the south with the railroad in between. 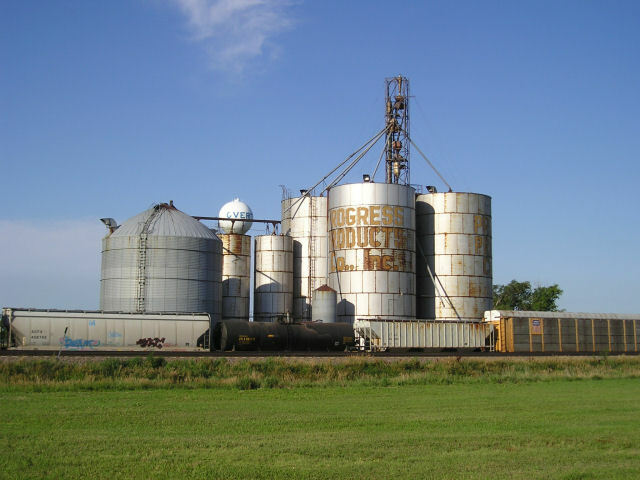 Large grain elevators are found along the railroad and an overpass leads to the exit off the interstate. 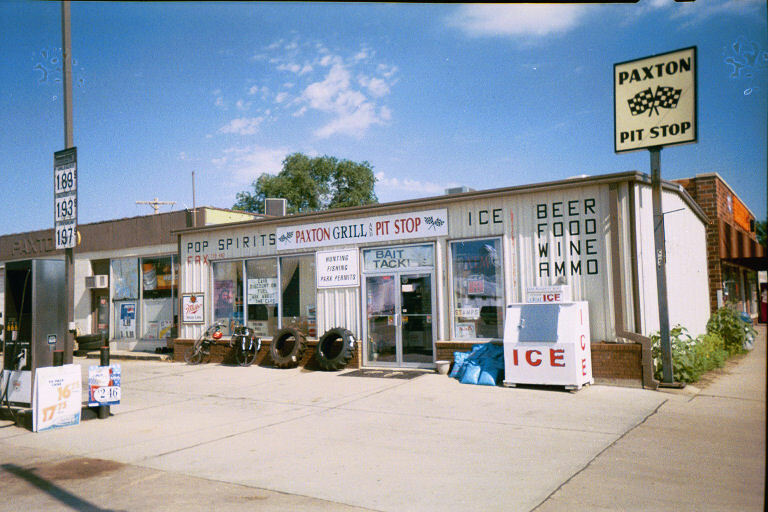 Crossing the overpass is best bet to find food or lodging and this is where I went in Ogallala. Leaving Ogallala the road became quieter as it crossed four small towns on way to North Platte. Southerland was largest of these and had cute downtown, nice park and several fireworks stands. I half expected to see a parade but my timing must be off. I first reached North Platte at 82 miles and had almost bypassed the town before realizing I was going to miss my lunch stop... circled back and had a late lunch at 90 miles. North Platte is a much larger town, 20000+ and regional center for the area. North Platte is confluence of Platte into North and South Platte river. Many trains in this part of the corridor. Seemed like a big switching exercise was going on as trains slowly passed each other most of the way to Maxwell. After Maxwell it was getting hot and I was getting tired, but fortunately not too far to Gothenburg. 127 miles for the day. My GPS says straight line to destination is now 445 miles. Today an easy flat ride through the middle of this middle state in the USA. Strong thunderstorm yesterday evening and threat of more today had me off early. 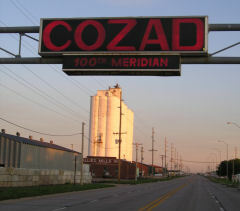 In Cozad I crossed the 100th meridian. In addition to being a round number, the 100th is the classic dividing line between areas with enough water and those with not enough. Crops on both sides of the 100th still appeared to be irrigated though. Flat smooth roads brought me through Lexington, Overton and Elm Creek. Just a hint of a hill into Kearney as I crossed the museum and had late brunch at mile 62. The road had been bending south and now it went north past industrial areas and along the tracks. Trains were very frequent, several per hour. 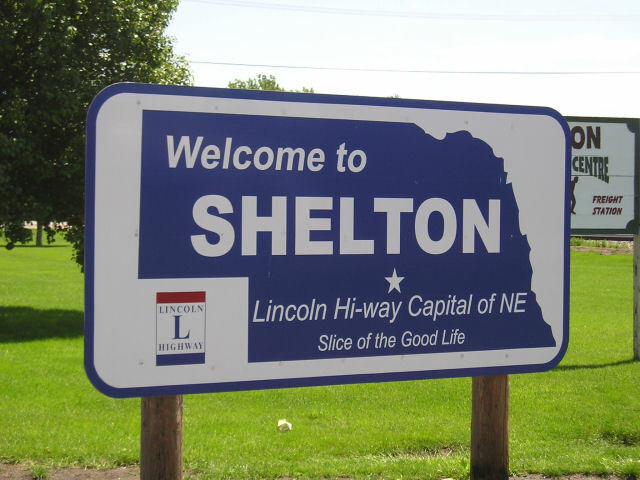 Shelton proclaims itself as "Capital of the Lincoln Highway in Nebraska". 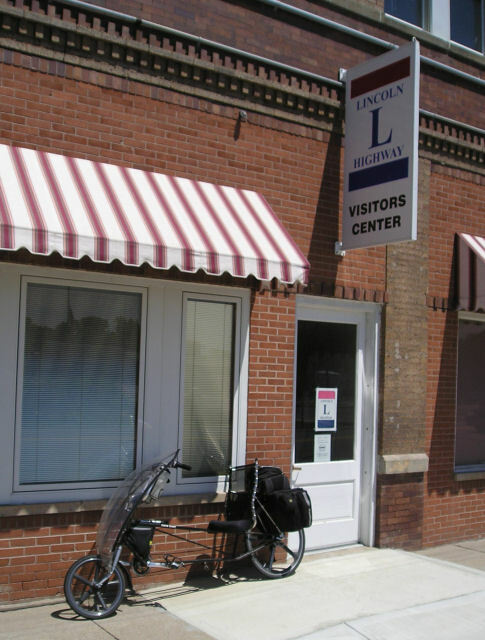 The visitor center was closed, but I bicycled once around the block including some brick roads on downtown and one cross street. Most telephone poles and many shops prominently displayed Lincoln Highway signs. From Shelton two more small towns and I was in outskirts of Grand Island. There was a sign for "old US 30", but I followed the new US 30. I was surprised to find it had Lincoln Highway signs. Just as I came to downtown I saw a motel and seemed like a good place to stop. Newspaper indicated a 4th of July parade at the museum. I walked downtown but didn't see anything. Did get a nice walk through old downtown Grand Island. There are some interesting buildings downtown. An easy ride of 102 miles today. I'm expecting another day of flat before some hills start. Flat cycling through farming areas today. 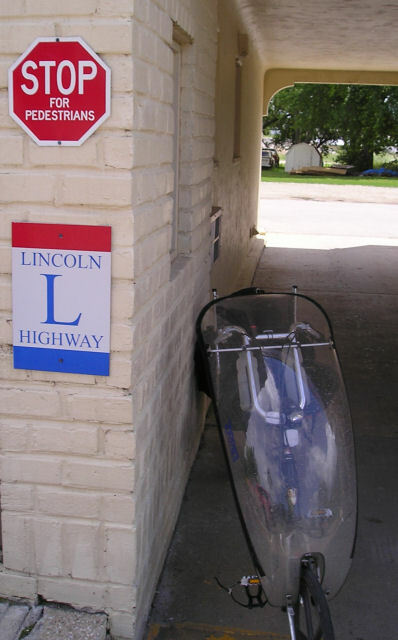 The only signs of Lincoln Highway I saw were in Grand Island. Storms came through last night leaving puddles along the road. It was overcast all day with intermittent showers. Some construction leaving Grand Island and then good shoulders and light traffic as the road followed the railroad with several trains per hour. At Chapman the local Gas & Pantry shop had a few booths filled with farmers, their coffee cups on the wall behind. I waited out a short rain shower to read the local newspaper. Central City was a small town with nice downtown. 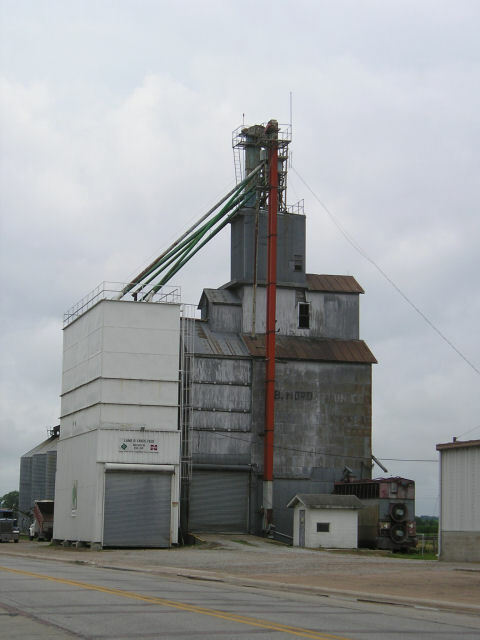 Clarks and Silver Creek weren't much more than a grain elevator and some houses. At Duncan talked with someone about my bicycle. Came into Columbus at mile 66 for early lunch. Columbus had a lot of traffic and I was happy to get out of town. Starting with a two lane divided highway, the road became progressively worse. A little past Shuyler the road became one lane each way. Next the shoulder became less. This was followed by road construction and light rain. After North Bend, the construction placed cones in the remaining shoulder. Traffic hadn't decreased since the four lane at Columbus, but now was was all speeding past in the rain. Came into Fremont and took business 30 into town. A wet but flat ride of 114 miles today. GPS says 252 miles to destination, so may take some shorter days coming up. The people of Iowa welcome you... but the roads do not. This contrast became clear right at the start as I left the Missouri River Bridge and cycled to the welcome sign. The shoulder turned to gravel. I rode about 40 feet on the gravel shoulder before realizing I would need to ride on the paved/concrete roadway. Traffic was cooperative but sometimes needed to wait to pass. Left Fremont under cloudy skies. Flat for seven miles to Arlington then rolling hills heading over to Blair. A gentle shower turned to heavier rain and made for good excuse to find place inside to wait out the rain. Downtown Blair had Lewis and Clark signs. Two miles later at mile 24 crossed into Iowa. Thirteen miles from Blair to I-29 and stop for breakfast. 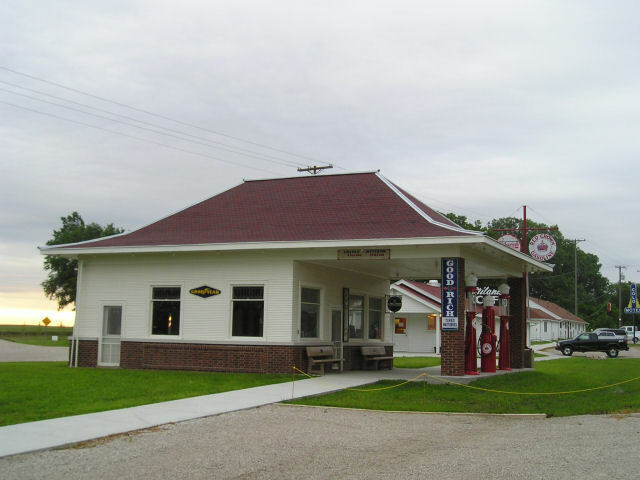 A few miles later in Missouri Valley several Lincoln Highway signs and an Iowa visitor center. 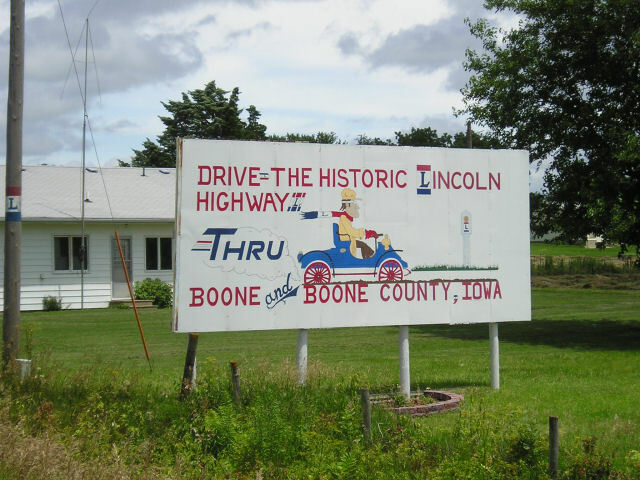 Locals explained that the Lincoln Highway went around the fields and followed section lines. Over the next miles several cross signs on gravel roads describing the route. From Logan, some headwinds and slower going into Woodbine at mile 52. Small town of Dunlap was lunch stop. This town had nice small downtown with older brick building. 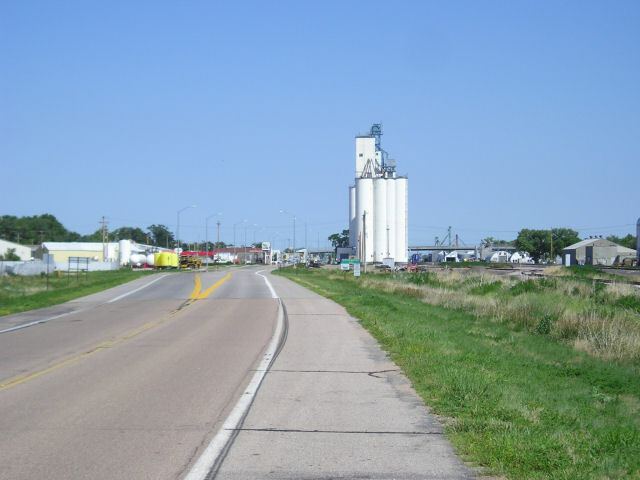 The grain elevators are becoming less prominent in towns compared to Nebraska. At Dow City I took a quick detour to climb a hill and find the "Dow House". 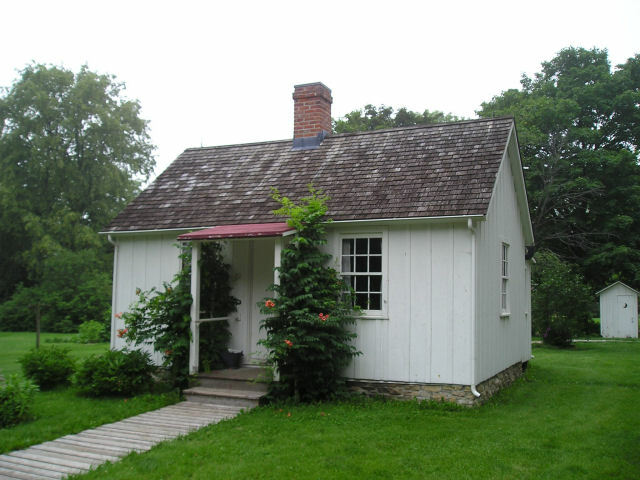 This fancy house of early settler was closed, so back down the hill and last few miles to Denison. In Denison several spots from the early Lincoln Highway. Cronk's Restaurant just across from the Park Motel with several Lincoln Highway signs. The motel was full as was the second motel I tried. Found third hotel in town still had room and took an early stop for the day. 81 miles today. Knee High by the Fourth of July. Corn in Iowa is much taller, some even taller than myself. A few of the fields have standing water, apparently from recent rains. Today still cool but light tailwinds and cross winds. US 30 continues with narrow shoulders. Many of the towns had Lincoln Highway signs today. Left signs at Denison and saw the next installment in Vail. Some very gentle hills but also nice winds meant fairly quick travel to Carroll at mile 28. 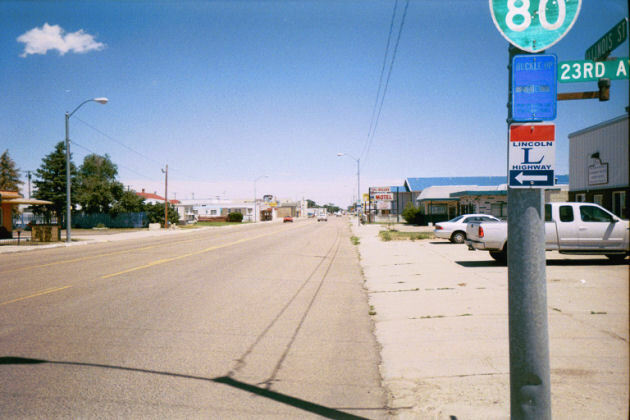 Unlike Nebraska, the towns are sometimes off the main US 30 route. Glidden was along the road but Ralston Jefferson and Scranton mostly off route. Brief stop in Grand Junction and then off route at Ogden at mile 73. Several Lincoln Highway signs through center of town. I took the old road here (E41). It descended down to cross Des Moines River and then back up. Several Lincoln Highway signs on the other side as I went through Boone. After Boone came back onto US30 which was now two lanes each way, still with gravel shoulders. Five miles later next exit to Ames. Ames was the largest town I've been through since Cheyenne. In downtown Ames, I made my way to Iowa State University and dropped in on college office-mate Gary Leavens who was now professor at ISU. A few more miles on Lincoln Way and out of town over I-35 and then into Nevada (pronounced Ne-Vade-A) and end to a 110 mile day. My GPS now says 90 miles to the destination. Today some delightful cycling along the old Lincoln Highway. Also some rather obnoxious riding along US30. 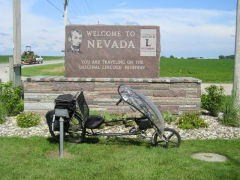 In Nevada the old Lincoln Highway is one mile north of the new US 30. This was a nice quiet road. After a few miles detour signs and indications the road was closed ahead. I continued straight anyways and walked past a construction zone. After eight miles was Colo and an old landmark, Niland Cafe and the Colo Motel. A few landmark signs and I was off. 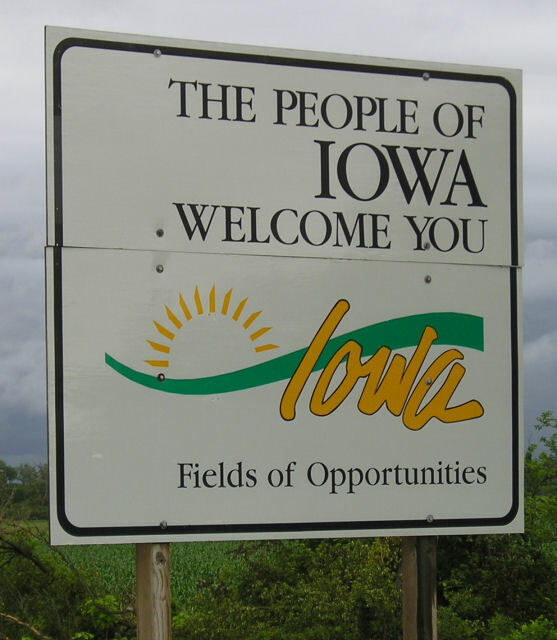 At 15 miles, State Center bills itself as Rose Capital of Iowa. From here some more traffic on the road and also a few hills. At 23 miles the side road ended and onto main US30. This was a 4 lane limited access highway. Think of an interstate type highway but with 12 inch shoulders. Tolerable but not as enjoyable as the country roads. After a brief breakfast stop at mile 30, back on the busy route. The road narrowed to one lane each way. Soon rumble strips appeared in the 12 inch shoulder. 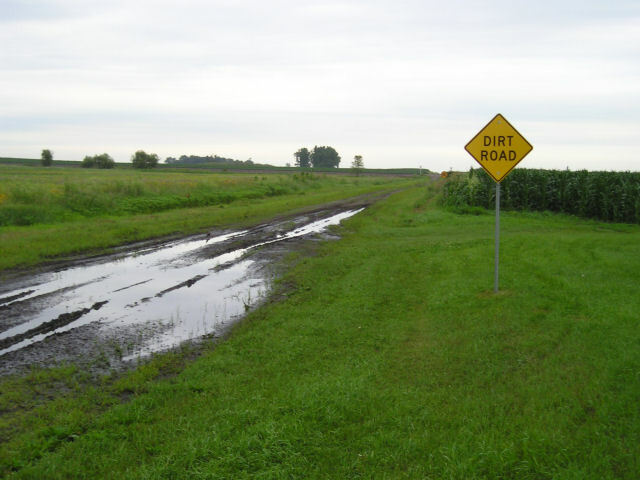 What was the Iowa Department of Transportation (IDOT) thinking? Surely not about touring cyclists! A few miles of this brought me to LeGrand and a few miles further I found another side route to follow. Turns out this road (T47, E49) was the old Lincoln Highway route again. 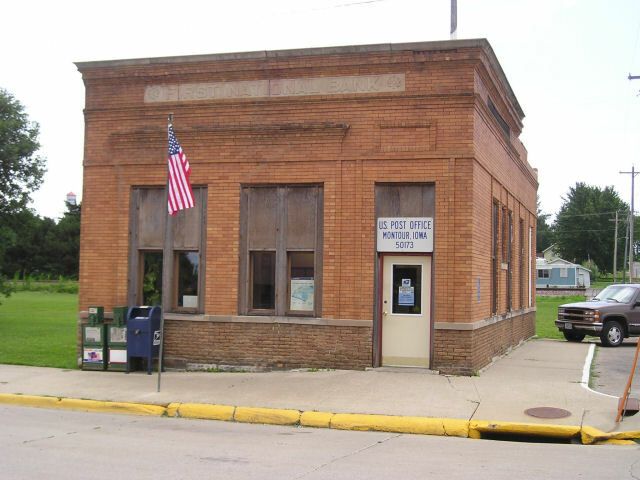 Came through Montour, "a small town and we like it that way" with combination fire station/city hall and small post office. Some nice backroads brought me to Tama. 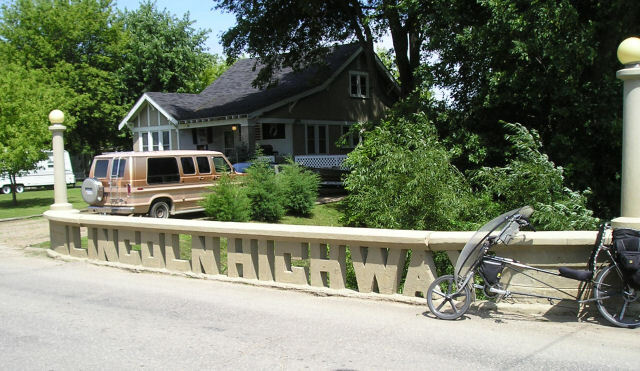 At Tama I found a historic Lincoln Highway bridge and circled back around to Toledo for a short ride of 53 miles today. GPS tells me I am within 45 miles of destination. An easy ride today to finish this trip. 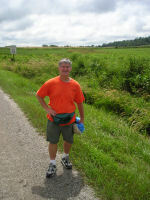 Only a few of the miles were on US30, though other US highways I tried also didn't have much in way of shoulders. Left early and down US30 for seven miles before taking the back road via Chelsea and Belle Plaine. 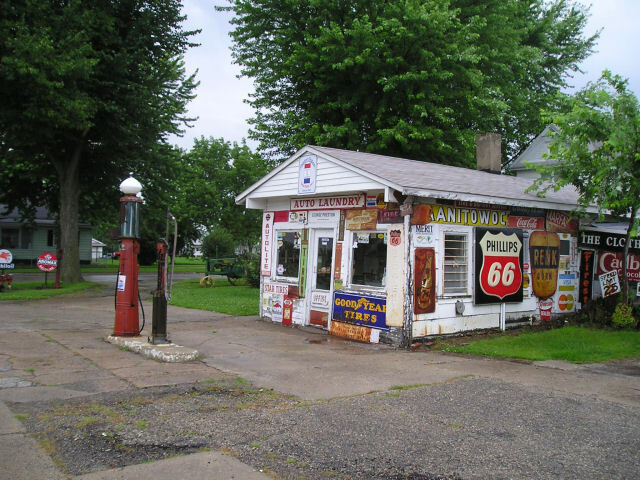 These two towns were on original Lincoln Highway route, though were bypassed in 1937. The route I took went mostly past Chelsea and into middle of Belle Plaine. After Chelsea it started raining lightly at first and then more heavily. 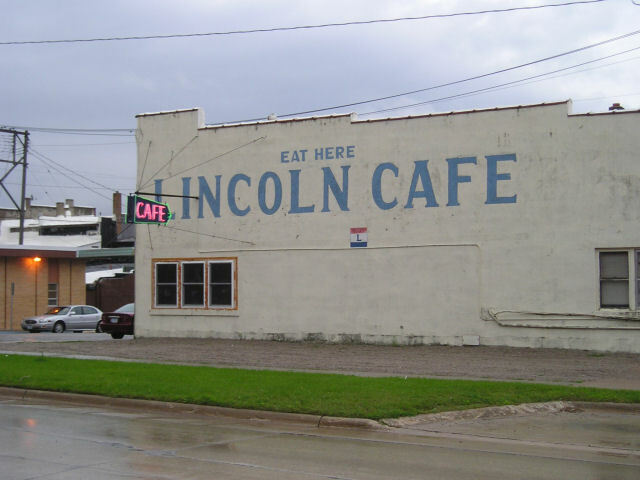 The rain was good excuse to stop into the Lincoln Cafe. After breakfast it was still raining so walked around Belle Plaine, read a newspaper and waited for rain to subside. An early competitor to the Lincoln Highway was the "Coast to Coast Highway", not mostly followed by US 6. I headed south to Marengo and met up with US6 there. 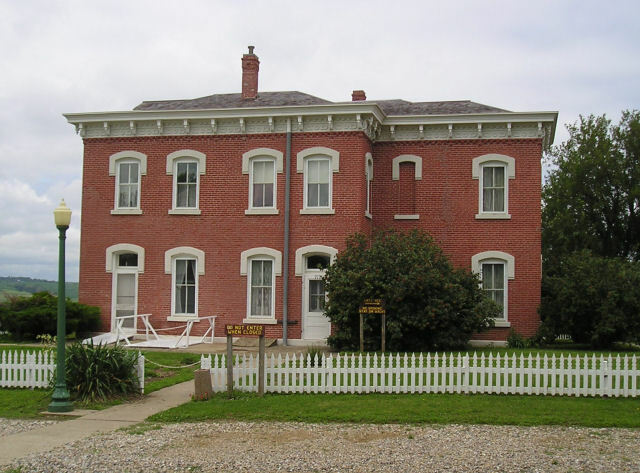 My reason was to cycle past the Amana Colonies, an early communal settlement by people first from Germany. Outside South Amana, I met briefly with Joe Hurley (route6walk.com). Joe is walking across America and following US 6. I had seen an article about him in the newspaper and was surprised to pass him in only 6 miles of US 6. I cycled through the Amana Colonies and stopped briefly at the visitor center. From here headed north and through Walford on my way to the Cedar Rapids airport. I have a mini-van reserved here tomorrow to drive back. Overall 65 miles today. In the morning I bicyled to the airport and picked up a mini-van for the trip back home. I drove along I-80 and thus retraced much of my route through Nebraska. 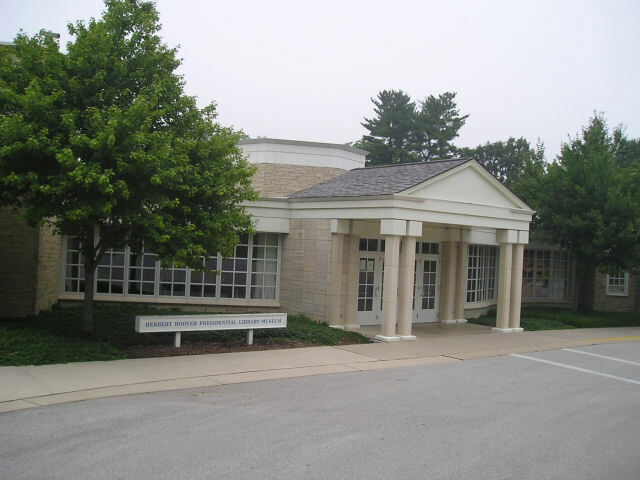 However, I first stopped in West Branch Iowa at the Hoover Museum. Hoover was born in Iowa, orphaned and raised with relatives in Oregon and California. Hoover was educated as an engineer and worked in Australia before being involved in relief efforts in China and in Europe after the first world war. He was a rising star in Republican party and Commerce Secretary who strongly promoted standards. Elected president in 1928, he was president at stock market crash and ensuing great depression. His reputation due to the depression and the FDR adminstration kept him out of public for fifteen years, before being pulled back into relief efforts after the second world war. I found it quite interesting. Of modern presidents, Hoover reminded me most of Jimmy Carter. This due to engineering background, humanitarian focus and a one term adminstration in time of economic woes. On the way back through Nebraska, I stopped at the Great Platte River Museum. This museum is actually perched over I-80. It is a bit hokey, but otherwise a nice set of displays that shows travels through this corridor over time. It also had a nice set of displays about the Lincoln highway. Overall, I enjoyed this week of cycling. Some long distances but flat terrain. 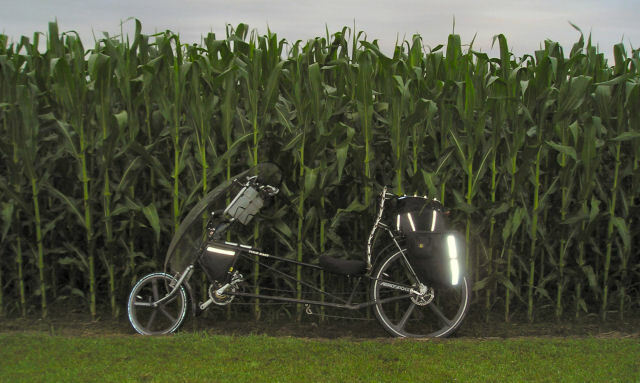 Weather better than expected and a good chance to get on the road with my tour easy recumbent.